Actually I wanted to capture the National Day function held in Marina Bay on 9th August 2007, unfortunately I was bit late so I could reach the location only after the function got over. That is how the Singapore night has been found in this blog. Singapore is a truly colorful country, for whatever function that the nation call for; you can see the Singaporeans wearing red colored t-shirts and dresses. You know what I too have joined with them wearing Singaporean national colored red dress on that day. My destination to visit in Singapore was primarily the Merlion statue(Lion head and Fish body), and I could do that in the national day of Singapore rather i would say national night of Singapore ;-) Look at the picture below here, this is a baby Merlion statue behind the taller one, you can see the taller back view also from this picture. Between the baby and taller spot the floating stage organised for the national day festival, when I took the picture the function just had completed situation. The whole country (city) was so excited to celebrate their city's birth anniversary. The story of Singapore known to almost everyone so I'm not gonna repeat once again. Here are some pictures that describes my Singapore night roam. Marina bay is one of the hi-fi commercial area of Singapore, the most taller building clusters are found here, I still remember seeing this building's pictures in my school notebook covers in India those days. Today I'm here in front of them. The attractive thing about Singapore cycles are the disc brakes(!!). 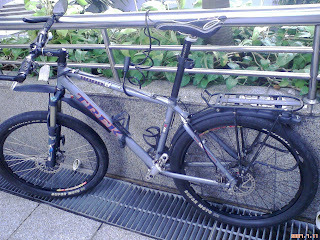 Yeah the Singaporeans are not as interested as Japanese to pedal the cycle but fascinated by their fancy cycles. There is no parking for cycles also in Singapore, hence most of the places you can see cycles tied with the road side electrical posts or barriers etc. Look at one of the cycle tied in my office wall. 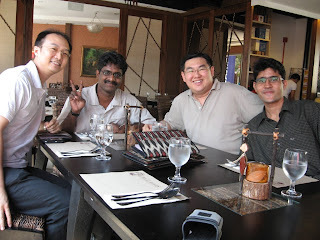 My first team lunch session in Singapore had happen a fortnight before, Indian, Filipinos, Singaporean Chinese, Malay Chinese and Indians were part of the lunch. We have chosen a Filipinos restaurant for our taste buds. Much of us had already experienced Chinese, South and North Indian, Korean, Japanese, Mexican and Junk American food but not that of Filipino's hence the choice. The hotel was located in Marina Square in Singapore, the hotel atmosphere was good and pleasing. You know what the hostess in the hotel was so friendly to ask us about our girl friends (???). 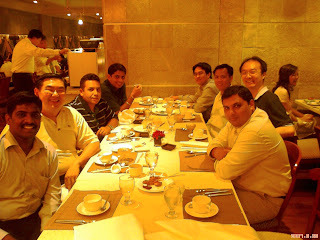 Most of the food items were prepared with Pork and that is a reason for my Indian colleague to feel uncomfortable. Actually he is a vegetarian and you know what he had finished his lunch with appetizers.